A report early Tuesday claims Apple chief Tim Cook was recently in China to meet with partner carrier China Telecom, possibly to discuss the upcoming debut of a rumored low-cost iPhone and declining sales growth in the region. 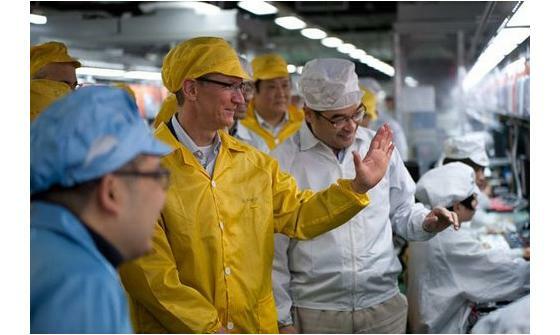 Cook visited a Foxconn plant in China last year. Citing sources familiar with Cook's meeting, tech.ifeng.com reports the Apple executive met with China Telecom's senior leadership this week. As of this writing, the talks are supposedly over, though it is not known if Cook has returned to the U.S. While the topic of the "secret" meeting was not revealed, the publication speculates talks could have focused on leveling sales seen during the July quarter, as well as the possible introduction of a "new generation" iPhone. It is unclear if the handset being referred to is Apple's expected annual iPhone revamp, or a new model some have taken to calling the "iPhone Lite." On Sunday, an image purporting to show the cheaper model's packaging displayed the name "iPhone 5C." The Chinese website goes on to say that industry analysts believe Cook visited China to bolster relationships between Apple and its partner carriers China Telecom and China Unicom. Cook previously visited China in March 2012 when he toured a plant operated by partner manufacturer Foxconn. Most recently, the executive met with China Mobile in January to discuss "matters of cooperation" with the world's largest cellular provider.